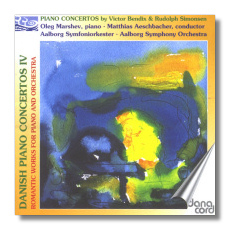 This is Danacord's 4th volume in the 'Danish Piano Concerto Series' and as with the previous three, the music is often interesting and well crafted. Nevertheless, these two concertos gave me the impression that at times, inspiration was on the wane and that both Bendix and Simonsen were slightly forcing themselves to the limit. Victor Bendix (1851-1926) enjoyed a discreetly successful career, initially but Carl Nielsen's 'modern music' and his scandalous private life contributed to his almost total neglect in no small measure. His Op. 17 was probably composed in the early 1880's and is considered as one of the few virtuoso romantic concertos in the Danish repertoire. The work, which is extensive in length (38 minutes) has a broad and serious 'first movement' followed by a lyrical and melodious 'Intermezzo' and a stirring finale, full of catchy tunes. Since the composer's death, this piece has been almost completely forgotten; so this recording will help no end in injecting fresh interest in this pleasing work. Rudolf Simonsen (1889-1947) today hardly raises an eyebrow, and throughout his career his popularity never exceeded the bounds of normality. For him, music was sacred, and he made it his mission to bring it to as many people as possible. To this end, he lectured profusely with great passion and boundless energy. His output is not large, but the chamber and vocal pieces that he wrote deserve more than passing interest. Maybe his most substantial works are his 4 symphonies, composed between 1921-25 which at the time were considered to be vitally important pieces towards enhancing the popularity of the Danish symphony. His piano concerto is an early work, first performed in November 1915 and is not considered as one of his major pieces, but nonetheless it contains many attractive tunes that alter between the dramatic and the lyrical. There is also a copious piano part full of virtuosic opportunities for the soloist. Oleg Marshev's consummate artistry works wonders and he fully succeeds in making these pieces sound better than they really are. The Aalborg Symphony under Matthias Aeschbacher lend excellent support and contribute vigorously towards making this CD an enjoyable experience of some rare but satisfying music.